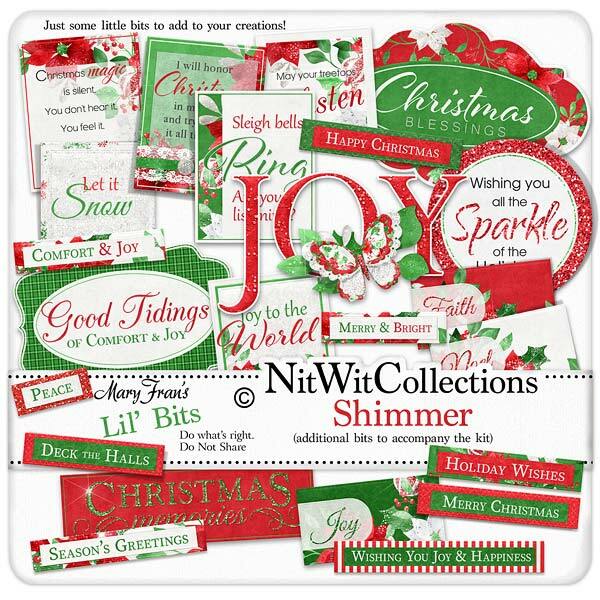 Lil' Bits "Shimmer" brings a whole new level of creativity to this sparkling digital Christmas kit with all of the premade journal cards, sentiments labels and more! Easily place these into your mini albums, cards and scrapbook layouts for stunning results without so much of the creative work! Don't miss out on these digital elements as they are not included in the FQB "Shimmer" Collection so please don't miss out on owning and creating with these elements! 1 Journal Card - "Let it Snow"
1 Title tag - "Christmas Memories"...we hope that your Christmas is full of them!